As part of the development of the nav6 IMU firmware, Kauai Labs has ported the officially-released Invensense Motion Driver v. 5.1 – enabling its use in Arduino and Maple platforms. Prior to the release of this library, Arduino developers wishing to access the Digital Motion Processor (DMP) functionality of the Invensense MPU-6050/MPU-9150 sensor could not use an officially-released version of software; instead, a reverse-engineered library released by Jeff Rowberg (developed with help from Noah Zerkin) at www.i2cdevlib.com was used. While the i2cdevlib library was excellent, it had not kept up with more recent releases by Invensense. Kauai Labs hopes that other inventors find this open source library useful. 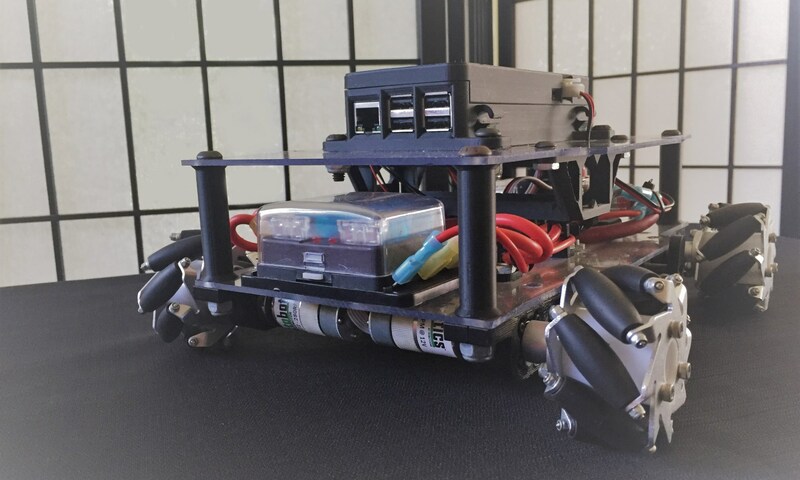 The “nav6” inertial measurement unit (IMU) was developed to provide sophisticated inertial navigation capabilities easily available to student robotics teams, including the FIRST Robotics Competition (FRC). This low-cost circuit board enables a 4-wheel omni-directional drive robot to be driven in “field-oriented” drive mode by accurately measuring the robots “pose” – the amount of tip, tilt and rotation – relative to the field. Additionally, the nav6 can be used to implement robot balancing algorithms. The nav6 employs the Invensense MPU-6050 IC which includes a 3-axis accelerometer and a 3-axis gyroscope and an on-chip digital motion processor. 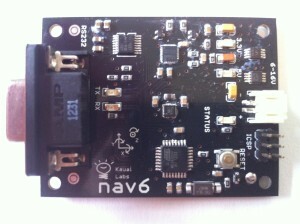 The nav6 also includes a Honeywell HMC5883L 3-axis magnetometer. The nav6 is also Arduino-compatible, and can be programmed by anyone via the free Arduino Integrated Development Environment (IDE). Additionally, software to easily integrate the nav6 into the FIRST robotics control system is available. Open-source schematics, nav6 firmware source code and cRio code to interface with the nav6 are available online. Given the popularity of the Arduino among the “maker” community, a large body of software and literally 100s of “shields” which allow extension of the board’s basic functionality by adding different components have been developed. Yet the Arduino’s underlying 8-bit processor running at 16Mhz, coupled with small amounts of FLASH memory and RAM often limits the projects that can be accomplished. This limitation has been mitigated to some degree by this year’s release of the Arduino Due, which moves the platform to a 32-bit processor running at 84 Mhz with 96Kbytes of RAM and 512Kbytes of FLASH. However last year saw the release of a much more powerful solution at a cost similar to the Arduino Due: the Netduino Plus 2, which features the STM32 F4 microcontroller. The F4, running at 168Mhz, has twice the speed of the Due’s processor, has double the RAM at 192Kbytes and double the FLASH at 1024 Kbytes. And that’s not all – the Netduino Plus 2 32-bit ARM processor also provides a Floating Point Unit (FPU) and DSP instructions that enable advanced signal processing. And last but not least, the Netuino Plus 2 has an ethernet interface for connecting directly to the internet. There was only one catch: Arduino developers used to the C-language and the Arduino API had to transition to use the .NET Micro Framework – a new language and a runtime. Moreover, the .NET Micro Framework consumes a significant portion of the onboard RAM/Flash on the Netduino Plus 2. Seeing this condition, Kauai Labs decided to provide Arduino API and C/C++ language development on the Netduino Plus 2, and has developed the free, open-source software library named “libmaple-f405”. This work is based upon the Leaf Labs “maple” library. This library is now available for anyone interested; we hope you enjoy it. Kauai Labs will again be presenting the “Inventing with Software and Electronics” class from June 15 – July 20, 2012 to be hosted at the Island School campus behind the Kauai Community College (KCC). This class is open from ages 10 to 100 and is a great opportunity to gain hands-on experience with the invention process – by designing and building fun projects using custom electronics and software. This year, we’ll using the “Sparkfun Inventor’s Kit for Arduino” to learn and create with. We are now accepting sign-up for this class, and hope you’ll join us! You can register in person at the Island School office; registration closes June 1. Contact Kauai Labs for more information. The Inventing with Software and Electronics class is underway and the students are having a great time. The curriculum, in an entertaining slide format, is now available on-line. The Create the Future 2012 Design Challenge contest is open from now until June 30, 2012. This contest was started in 2002 by the publishers of NASA Tech Briefs, and is open to the public – featuring a Grand Prize of $20,000 as well as a number of smaller prizes. In order to submit your innovative design idea, inventors need only submit a 500 word technical abstract that includes one to three visual illustrations. There’s also an option of submitting a video in support of your design. All submissions are open for all to see at the Design Challenge website. Reading the amazing ideas already submitted is definitely food for thought, for example the life-saving “LIFE PACK – Hypothermia Prevention Flotation Device” invention in the Safety and Security section. NASA’s “Summer of Innovation” Mini-Grant Program has awarded a grant via the Kauai Robotics Alliance to fund two seminar type sessions where Kauai’s middle school and high school students will become familiar with the NASA Mars rover programs. More details on this “space grant” are available at the “Summer of Innovation” website.